Our pear-shaped engagement rings feature distinctive teardrop-shaped brilliant cut diamonds, hand selected for their intense sparkle. Teardrop diamond engagement rings provide the perfect opportunity for uniqueness beyond the popular round and square diamond shapes. We have a carefully considered collection of pear-shaped diamond rings with a blend of setting styles. Choose from pear-shape halo settings or designs with side stones. Many of our pear solitaire designs include very simple settings, crafted to order in a wide choice of precious metal options including Platinum, Palladium, and 18ct white, yellow and rose gold. Elegant Pear-shaped diamond solitaire engagement ring with channel set diamond shoulders and three claw setting. A luxurious 3 claw pear shaped solitaire ring design. Featuring an amazing pear shaped brilliant cut diamond, held within a simple 3 claw setting above diamond set shoulders. 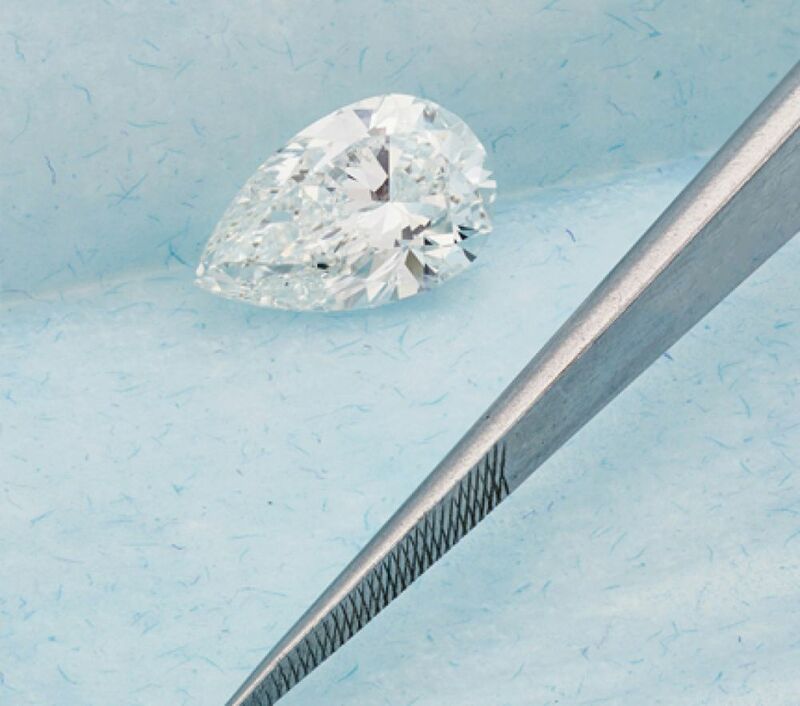 In addition to your selected diamond weight, we provide a further 0.20 carats of channel set diamonds across the shoulders to match. Timescale approx. 3-4 weeks. Beautifully presented in a wood box with branded outer packaging as shown below. A Pear shaped diamond solitaire engagement ring with twist design. Pear shaped brilliant cut diamond, Three claw setting, Incorporates protective V claw, Cross-over twist design. Available in 18ct White Gold, 18ct Yellow Gold, 950 Palladium and 950 Platinum. Wood boxed, gift packaged. Approx. 14 working days delivery. A stunning 3 claw pear shaped diamond solitaire engagement ring Three claw setting. V Claw to protect tip. Pear shaped brilliant cut diamond. Tapering shoulders. Wedding ring fit. Available in 18ct White Gold, Yellow Gold and Platinum. Supplied wood boxed and gift packaged. 14 working days for delivery. A modern Pear-shaped diamond engagement ring, single stone design, created with solid tapering shoulders and an elegant court profile band. With the subtle difference of solid shoulders, this alternative to R1H014, provides a wonderfully simple design for any pear shaped brilliant cut diamond. We apply a suitably sized ring setting for your diamond choice, across many optional carat weights, colours and clarities. The diamond is secured by 3 elegant claws, above slender tapering shoulders with a court ring profile. Modern 3 claw pear shaped solitaire engagement ring with open tapering shoulders and 3 round claw setting. Pear-shaped brilliant cut diamond. Full choice of sizes and specifications. Simple three claw detail with rounded claw settings. Court profile band, with open tapering shoulders. Approx. 3-4 weeks to produce. Delivered fully insured, wood boxed and gift packaged. Pear engagement rings feature the more unusual tear-shaped diamond, rounded at one end, tapering to a point at the opposite end. Many of our pear cut engagement rings include three claws to protect the diamond. Within our collection, you will discover many unusual styles. Some designs include smaller, perfectly cut round brilliant diamonds surrounding the pear in popular halo setting styles. Our pear solitaire rings remain a favourite with many first-time ring buyers. We craft each ring design over four weeks, working from the raw materials. We offer responsibly sourced precious metals including 18ct Fairtrade Gold. Sending worldwide, enjoy the beauty of Serendipity Diamonds in many countries across, with tax and duty included at the point of sale. We deliver daily from our UK showroom. 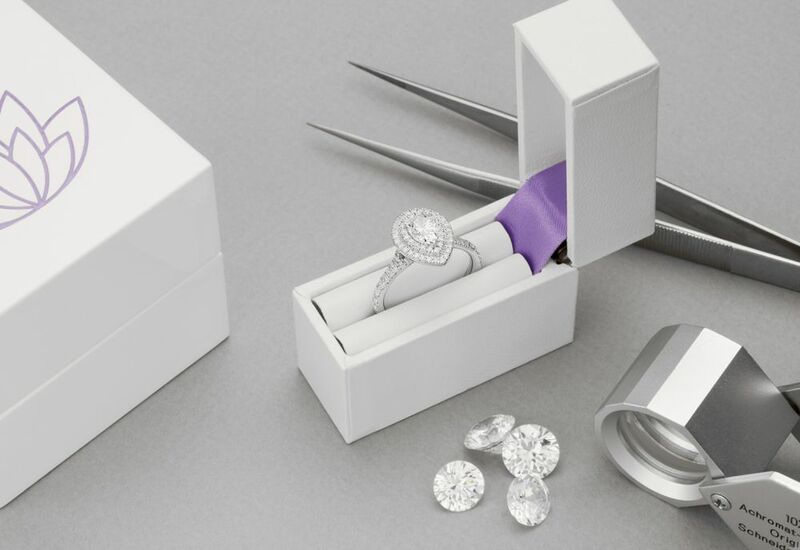 All rings are beautifully packaged and arrive by secure courier for a truly personal touch. Our expert team remain on hand to give all the advice you need when selecting your pear-shaped diamond. We work with GIA certification to give you the ultimate reassurance when buying your diamond engagement ring at Serendipity.